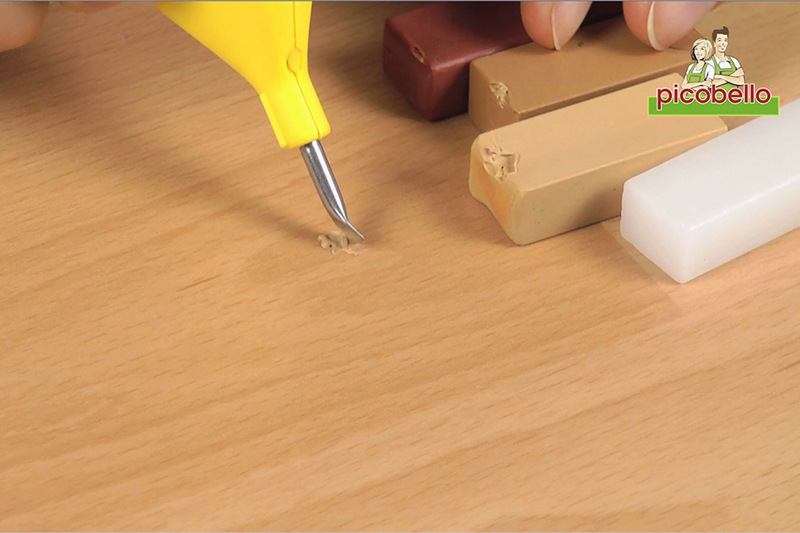 Repair scratches, dents and small holes on laminate and wood flooring, furniture, doors, and kitchen cabinets. 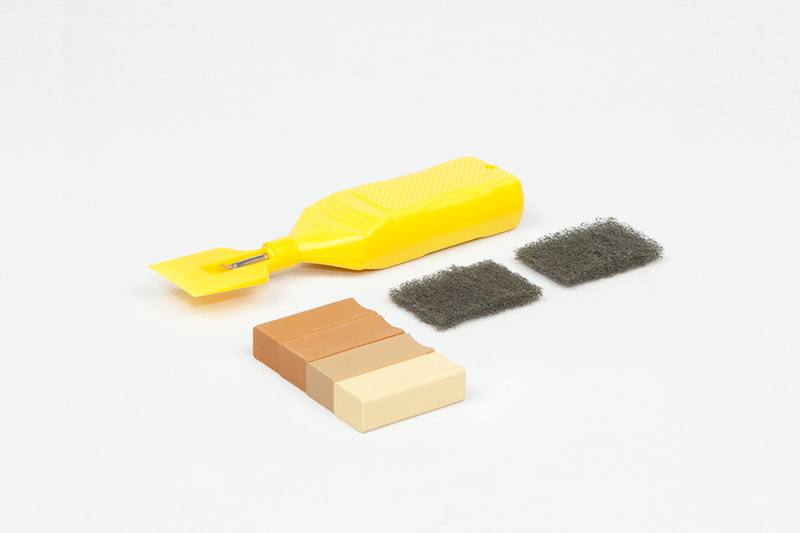 The Mini Repair Kit contains 4 shades of filler and is available in five different color assortments - light, medium, dark, cherry and white/grey to cover a range of wood shades. Tip: if you want to protect the repaired area from dust and dirt - seal with the Clear Lacquer Brush Pen or AQUA Claer Lacquer Brush Pen. 1) Preparation: The area to be repaired has to be clean, dry and free from grease. If necessary, remove any loose or sticking out particles. 2) Color Selection: Make sure to use always several colour shades from light to dark. 3) Melting: Hold the button down on the side of the combination tool for 30 seconds and then touch the tip onto the fillers. The filler will then melt onto the tip of the tool. 4) Filling Touch the tip of the applicator onto the damaged area and the filler will run into the affected area. TIP: Start with the lighter background colour and gradually apply darker colours to mimic the darker grain shade. 5) Levelling: The filler will cure in approximately 30 seconds. Hold the applicator with the grooves flat to the surface and then move it back and forth over the filler until all surplus filler has been removed. 6) Color Adjustment: For precise adjustment, imitate the grain pattern with a darker hue of filler. Then again, level off excess material with the grooves of the Mini-Melter. 7) Finish: Use the grey sanding pad to degrease the area. At the same time the gloss sheen of the repair is flattened.